Offer is to run from 1st April – 31st May 2018 and tee times to be booked via the pro shop in advance. Please call 01427 718273 to book and check availability. On arrival at the pro shop, please fill in the required forms for yourself and each of your guests. Your guests will then be entitled to a reduced green fee by £5.00 for each of their rounds. Upon completion of your rounds, please return to the pro shop where you will each be presented with a £5 voucher to spend on food and beverage that day. 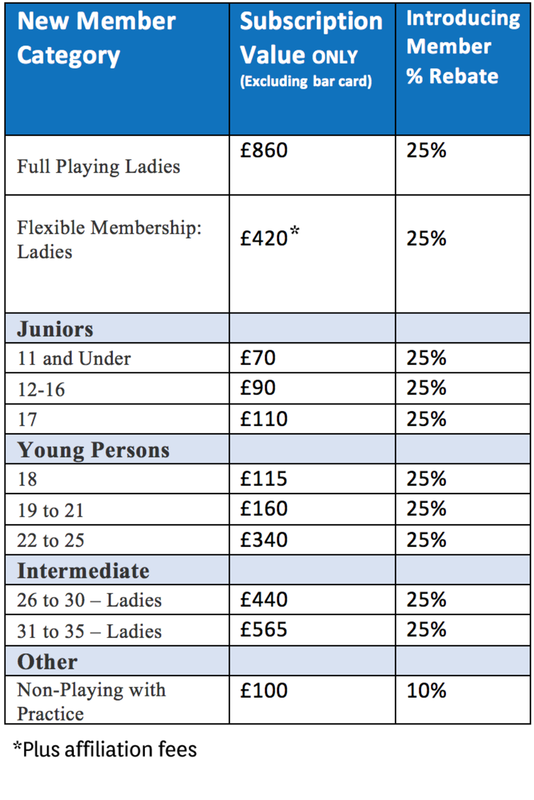 The table below lists the 2018 Subscription fees for NEW member categories included in this offer. Should your friends or family wish to join our membership, as the INTRODUCING member you will receive a rebate from your own 2018 subscriptions. The value of rebates are shown below alongside the applicable membership category. Once the New member has paid their subscription, you will receive your rebate and also receive an additional £10 to your bar card. You will receive both a rebate and an additional bar card value for each new member you introduce. This offer will run throughout April and May 2018 and be subject to available tee times and the appropriate forms being completed. Rebates can only be allocated to the introducing member once new applications have been successfully completed and subscriptions received.